On Being The Right Size (Hollywood edition). I can’t believe it, but I am going to link to Gregg Easterbrook twice in one day without (too much) snark. So, while his TMQ column for Monday (sic) did contain an elementary error (the planets move against a background of the “fixed” stars, not the other way round — which Easterbrook honorably corrected at the top of his next column) he gets something else quite right. Read the whole thing. It’s smart, witty, elegantly written, and it contains one of the earliest popular accounts of perhaps the most important single change in the practice of biology in the last century. Haldane himself was one of the pioneers in the mathematical treatment of natural selection and evolutionary theory, and he introduced the general public to the virtues of applying even the simplest quantitative ideas in “On Being the Right Size,” a simple, virtuouso tour through the implications of scale for everything an organism might want to do. That’s real writing. Once read, it is impossible to forget the idea within the image. 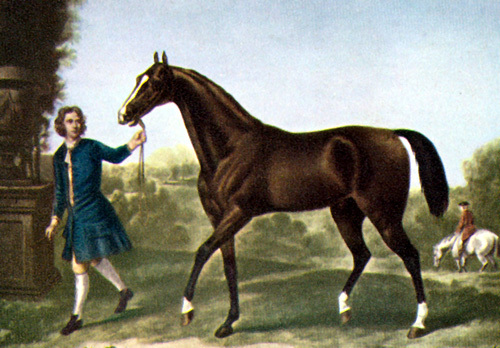 Image: The Darley Arabian (one of the three founding horses of English thoroughbred brood stock. After 1704. Source: Wikipedia Commons. This entry was posted on January 25, 2008 at 12:08 pm and is filed under good public communication of science, Mathematics, science writing. You can subscribe via RSS 2.0 feed to this post's comments. I use this in teaching about the importance of size.